You can check out the match report here. And now I recommend you follow the Champions League live text here. Barcelona go six points clear at the top of La Liga with a deserved win as Lionel Messi becomes the first man ever to score 300 Spanish top-flight goals (and then the first to score 301). Three minutes added on that neither side really want. This game is done. Sporting Gijon attacking midfielder Alen Halilovic gets the ball about 30 yards out and has a pop but it's over the bar against his parent club. Not too long left now before this game reaches its certain conclusion. Barcelona midfielder Sergio Busquets gets booked, which sees him suspended for Saturday's trip to Las Palmas. He's immediately replaced by Javier Mascherano. And Gerard Pique comes off for Marc Bartra at centre-back. Luis Suarez chases onto a Lionel Messi through ball and Ivan Cuellar rushes out to take the ball off his feet at the edge of the box. If the keeper had got that wrong, he'd have been off. Sporting Gijon bring on Alex Barrera for Alex Menendez, who was one of their liveliest players and assisted their goal. Admittedly that goal feels like a lifetime ago now. Lionel Messi plays a ball over the top to Arda Turan, who is unmarked. The Turkey international has two options - either shoot from an angle or square it to Luis Suarez - who couldn't miss. He can't really make his mind up and he almost seems to pass it wide of the far post. Barcelona have only scored directly from eight of their 16 penalties this season, although one of the ones not scored was the Lionel Messi to Luis Suarez goal. Even so, that's a pretty shocking record. Brilliant by Luis Suarez, he gets the ball in the box with two defenders around him, a couple of good touches and he's in space and then he just curls the ball off the inside of the post and in. Wale Ibraheem: The keeper gave away the penalty and saved the penalty. It's redemption week. On Sunday, Luis Suarez scored from Lionel Messi's penalty. Today the Uruguayan takes it himself but Ivan Cuellar dives down to his right and saves it. Good keeping. Sporting Gijon keeper Ivan Cuellar comes flying out of his goal and takes Neymar out of the equations. He's booked, rather than sent off, as the forward was a bit wide. Sporting want a penalty as Alen Halilovic goes down in the box but he'd kicked Arda Turan's leg instead of the ball, which is why he'd gone down, so no penalty. Marcus: However fantastic Messi is, Spanish league is boring as only three teams can win it, and Barcelona top favourite. Give me the Premier League. Until this season, isn't it just the same three or four teams who challenge for the Premier League every year? Neymar plays the ball through to Luis Suarez, who tries to flick the ball over keeper Ivan Cuellar but a defender clears it, I'm not sure it was going in anyway. Neymar then bicycles the ball over after it lands to him. Sporting Gijon forward Alen Halilovic tries to cross the ball in but instead blasts it at Sergio Busquet's head. The Barca midfielder looks in some discomfort and has to go off for treatment. I think Halilovic might get a crunching tackle from Busquets in his first Barcelona training session next season when he returns from his loan spell in Gijon. 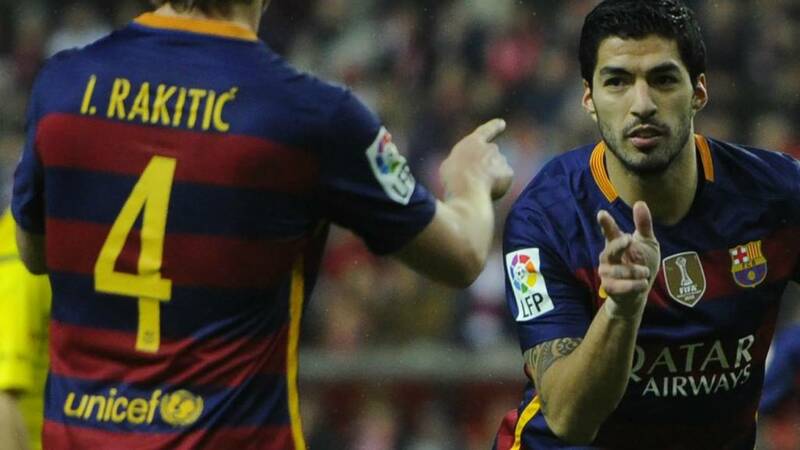 Luis Suarez is the first player in this season's La Liga to reach double figures in goals and assists. He has scored 23 and assisted 10, including Lionel Messi's second today. Luis Suarez thinks he's in to make it 3-1 here but he just timed his run wrong and was flagged offside. Damien Hill: Here's a topic for discussion, how many goals will Messi end up with? I reckon 500 at least..